While I tend to agree with the sentiment of the cartoon, the war in Afghanistan started before the current war in Iraq. The war in Iraq has not been “moved” into Afghanistan – they have both been, and still are, going on simultaneously. 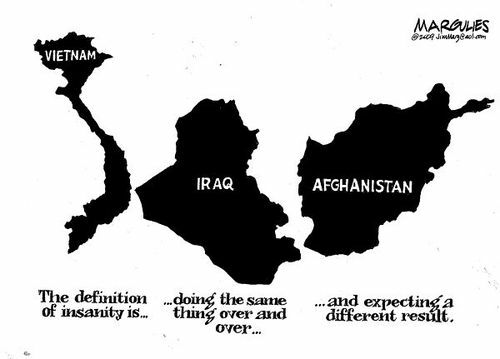 The power of images like this to reframe reality is powerful – as many people view Afghanistan as the same pointless war in Iraq, despite the fact that most people both within the U.S. and the international community felt the initial entry into Afghanistan was justified based on Osama Bin Laden’s involvement with the Taliban in Afghanistan. The farce of the war in Iraq caused the U.S. to lose support and now that loss of support has translated over to the Afghan war as for some reason people conveniently forget that Iraq is still happening.